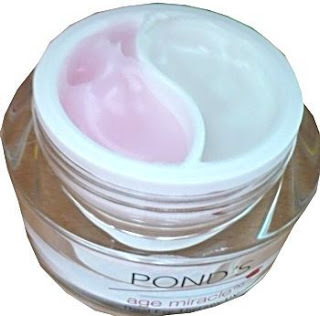 I'm very impressed with Pond's these days. They've totally revamped their image by launching so many different products for every skincare need. Their pinks and reds packaging are oh-so-very-attractive too and comparable to some high-end brands in the market. I just want to try them all! I figured I needed to start using eye creams, since the years are passing by real quick *sob* so I bought myself the Pond's AMDET and I'm absolutely in love with it! It's exactly the type of eye cream I had in mind. They say that once you start putting on eye creams, you'll never be able to live without them again. In my case, so true. I get up in the middle of the night to put it on in case i forgot, and I'm already thinking about which one to try out next. White cream ---> Brightens up and smoothens the undereye area, reduces puffiness, easily absorbed. When I've scooped out more than I need for my eyes, I use the extra it on other dark spots on my face, mainly freckles. Pink cream ---> I just LOVE how silky this feels, making me wish I had a big pot of it so I can use it on my whole body =). It helps reduce crow's feet and wrinkles, eyeshadow goes on much more smoothly with this as a base. Every now and then, I like to apply it lightly on other areas of my face like my laugh lines, frown lines and even my lips. I just wish this product came with a small plastic spatula because I don't like to dip my finger in it everytime. I use plastic toothpicks for that at the moment. It costs Rs.495. Some might say it's a little steep for an eye cream, but I think you totally get your money's worth considering it'll last you a long time as you just need a very small amount of the product everyday.